A little late getting this posted. This past week was a second marathon of high school football. In all, I totaled ten games in five days. It opened on Thursday night at Don Richards Memorial Stadium in Cortland, Ohio. Cortland Lakeview played host to rival Warren Howland. Was a fun game shown tape-delayed on local TV. Big crowd for a small stadium. The Division IV home team got crushed by the Division II visitors. On Friday it was off to Steubenville for the Division III state runners-up Akron Buchtel Griffins to play Big Red. Big Red made for a nervous first 24 minutes before making the needed adjustments and winning a quick contest in stifling humidity and heat, 22-6. After the game, I rushed out to Wintersville to catch the last 19 minutes of the Indian Creek-Linsly (WV) game. With the high score, the game run over three hours long. An interesting no-defense game that led the visitors, 54-32, to a victory. On Saturday, it was a trek around Ohio and West Virginia to catch three games. The day opened in Cadiz at Harrison Central in the unmitigating heat. 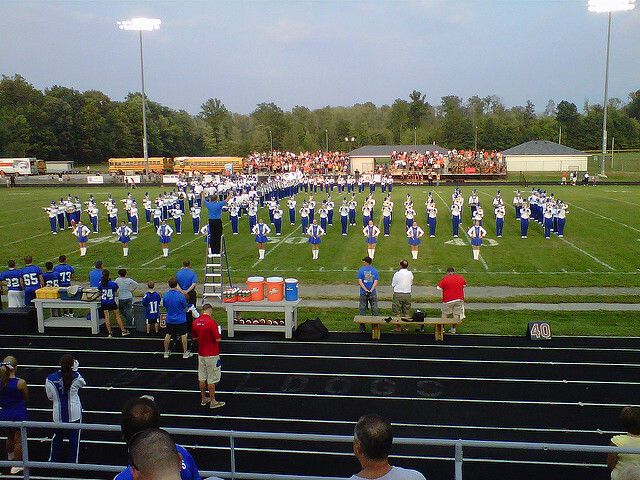 Hosting Weir High of Weirton, WV, the Harrison Central Huskies were up 35-6 in the third quarter. I left and drove the 20 minutes to Bowerston to watch host Conotton Valley take on Bellaire St. John Central. Now, a quick comment about Conotton Valley. 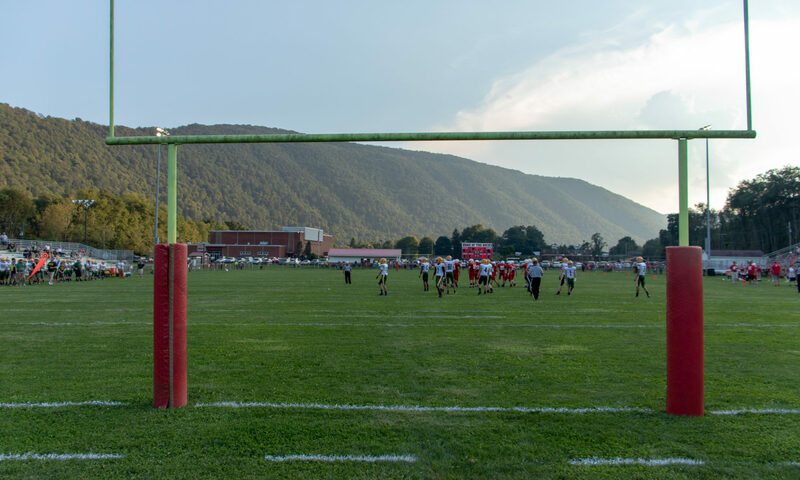 They were riding a 23-game losing streak and are a very small school in a very rural area with a very small stadium with no lights. Yet, it was the most enjoyable of the day. When I got there, the home team was just scoring another touchdown to go up 41-0 in the middle of the third quarter. The fans were into it. The team was excited yet showed unbelievable humility to their opponent who, despite the 23-game streak, were gracious victors when they could’ve been rubbing it in for finally getting a victory. Two more touchdowns and a gimme by St. John Central made it 54-6. Conotton Valley even had the courtesy to kneel three times and punt after a turnover with little time remaining. Congratulations to the Rockets. After the game the team gathered near their ‘victory bell’ to celebrate their first win in three seasons. The coach was beside himself. After that, I drove to Stuebenville to meet the wife and both went to Jimmy Carey Stadium in Weirton, West Virginia for the Weirton Madonna-Steubenville Catholic Central game. It was my first time over there, and I got lost going to the stadium. How, I don’t know. Anyways, we got there just a few plays after kickoff and sat on the Madonna side. Now, this stadium has character. It’s beside the steel mill and is a rather imposing backdrop. The field was grass and the home stand sit almost 10 feet above the surface back from the sideline at a good angle. The stadium has been spruced up a bit, but it is on its way out as Weir High’s home field. I’m not sure what will happen with Weirton Madonna. One nice thing about this stadium was the home side faced east and had a large hill behind it to block the sun at the start of kickoff. As for the game, Weirton Madonna was just flat out better and win going away, 28-7. The next day, it was a drive to Pennsylvania to catch the made-for-ESPN Gateway Kickoff Classic at Gateway High School’s Antimarino Stadium. Gateway is the public high school in Monroeville on the east side of Pittsburgh. For the day there were two games, Pittsburgh Central Catholic-Archbishop Wood and Gateway-Bishop McDevitt. Archbishop Wood hails from the Philadelphia suburbs while Bishop McDevitt is from the state capital, Harrisburg. This was my second time seeing McDevitt. The first was the PIAA 3A title game last year. Pittsburgh Central Catholic has won every game of theirs that I’ve attended. The first was the 2004 WPIAL 4A Semifinal against Upper St. Clair, a game against Erie McDowell in the 2004 PIAA playoffs, the Rally in Wheeling, the Rally at the Wolvarena, and now this game. I won’t recap much, because it was on ESPN. As for the stadium, it was decent. For a 4A school (largest classification in Pennsylvania), it was rather small. The stands sit entirely on one side of the field. A nice mural/banner hangs on the fence across the field behind the visitors’ bench displaying their various titles. The field sits inside the track and has only one entrance on the far left of the field from the stands. The press box/upper concourse is nice and a great place to huddle to wait out the two lightning delays on the day. The food was decent as they had wings, Arby’s Roast Beef sandwiches, Brisket, etc. The game program I got was drenched and is probably still drying out. It was a wet, wet day. For the later game, Gateway came in wearing their gold/black Georgia knockoffs. Bishop McDevitt came in wearing the apparently mandatory catholic school gold helmet/pants with white jerseys with blue numbers attire. One big knock I have against most Catholic schools is the lack of originality in their colors/uniforms. McDevitt was the favorite, but Gateway would have none of it. They were faster, made bigger plays when necessary and pulled away late in the game. Gateway won, 28-7. Two things about the PA announcer before I wrap this up. The same with the Covington Catholic-Dixie Heights game, if both teams have the same nickname (this time Vikings) do not reference Vikings for field position, yardage, etc. Secondly, the man calling the game kept calling the “mcDivot” like the golf term, rather than “McDeh-vit”. Much to the disgust of the McDevitt fans, this happened throughout the game. Then, he’d correct himself before falling back into calling them McDivot. After the game, I drove home drenched and got ready for an early morning drive to Columbus. There, I sat and watched in quite pleasant weather the two Kirk Herbstreit National Kickoff Classic games. Glenville may be more talented, but are one of the sloppiest teams I’ve ever witnessed. Little Memphis, Texas had better ball handling than Glenville. Camden County came out as the real deal in the game. In the night cap, Centerville just didn’t have enough in the tank to keep pace with Indianapolis Cathedral. After converting three fourth-down attempts in their last drive of the first half, they settled for a field goal to make it 14-10. They never got any closer than that. I really think they needed to take a better shot at the endzone than playing it safe for the field goal. That four-point margin was a psychological blow to the team that I don’t think they felt they could recover from. Cathedral came out and made it 21-10 and it was over. Two scores was too much for them. After that, I drove home. Another long weekend. But oh what fun it was. Since I already know my plans for this weekend, I’ll be seeing two games in Colorado. If all goes well, I should have a write-up sometime Saturday afternoon, Sunday or Monday.